This course will cover the topic of genetically engineered foods, how they are produced and how they differ from naturally occurring foods. The course will focus on foods that have been genetically engineered with bacterial DNA that either allows the plant to produce its own insecticide or allows the plant to be resistance to large amounts of specific herbicides. Health concerns regarding genetically engineered foods themselves (also called genetically modified organisms or GMOs) and the insecticides and herbicides associated with them will be discussed. The course will also review potential proposed benefits of genetic engineering. The purpose of this activity is to enable the learner to describe what genetic engineering is; how it differs from traditional breeding and hybridization; what foods are currently genetically engineered or contain GMO ingredients; what traits are commonly found in genetically engineered food crops (e.g. insecticide production, herbicide tolerance/resistance); the debate in support of and against genetically engineered foods and their labeling; and what effects genetically engineered foods and related pesticides may have on human health. Dietitians/nutritionists may submit activity evaluations directly to CDR; [email protected] or mail to: Commission on Dietetic Registration, Attn: Accredited Provider Unit, 120 South Riverside Plaza, Suite 2190, Chicago, IL 60606-6995. 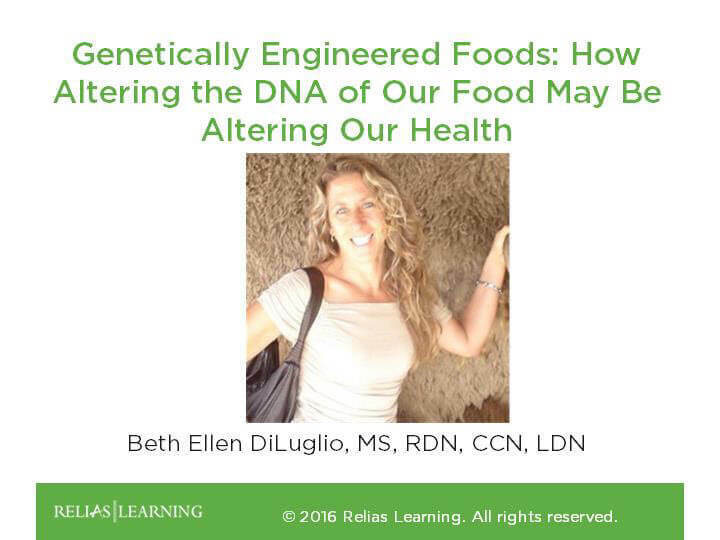 Explain how to clinically assess patients for suspected adverse reactions to GMOs. The target audience for this course is: intermediate level Dietitians; intermediate level Nurses; in the following settings: All Healthcare Settings.